LAREDO, TEXAS BIRDING FESTIVAL/MARCH 24-26, 2010: YIKES! Canon 70-200mm f/4L IS lens (handheld at 176mm) with the EOS-1D MIV. ISO 400: 1/320 sec. at f/4. Exposure confirmed via histogram check. Fill flash at -2 stops. 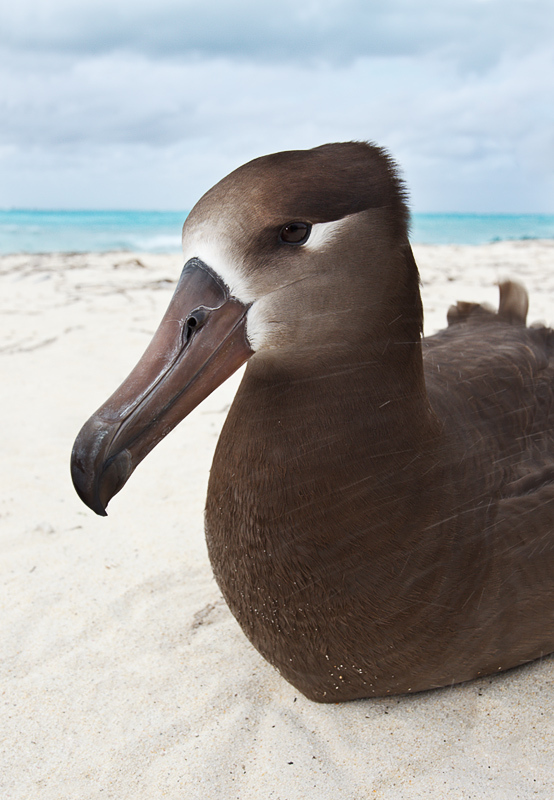 Though most of the species on Midway are inordinately tame, the Laysan Albatross are totally accepting of humans. Creating tight images even with a short lens is child's play. They will often approach you out of curiosity. When I wished to photograph resting birds like this one at close range, I simply sat on the ground and moved slowly. I receive dozens of e-mails in response to each Bulletin. I strive to respond in a somewhat timely fashion to each and every one of them. But, on average, more than three of every four Bulletin-related e-mails that I receive includes all of the text and all of the images. Opening an e-mail that contains the entire Bulletin takes anywhere from 30 seconds to a minute or more. Opening an e-mail from which the irrelevant images and text have been deleted by the sender takes about one second. While 30 to 60 or so seconds may seem like a short time to some of you, this time adds up rapidly and prevents me from working quickly and efficiently. If you do respond to an e-mail, please take a few seconds to delete all irrelevant images and text. Thanks. Canon 17-40mm f/4L zoom lens (handheld at 29mm) with the EOS-1D MIV. ISO 400: Evaluative metering +1 stop: 1/250 sec. at f/10. Fill flash at -1 stop. On a cloudy morning in the middle of week two I left our eight passenger limousine (goldfcart) with only the 17-40mm wide angle zoom that I borrowed from Canon Professional Services just for the Midway trip. When working with very tame birds, I prefer cloudy days so that I do not have to worry about my shadow being a distraction in the image. Placement of the horizon line in images like this is a big challenge; you can vary its placement by getting slightly higher or slightly lower. 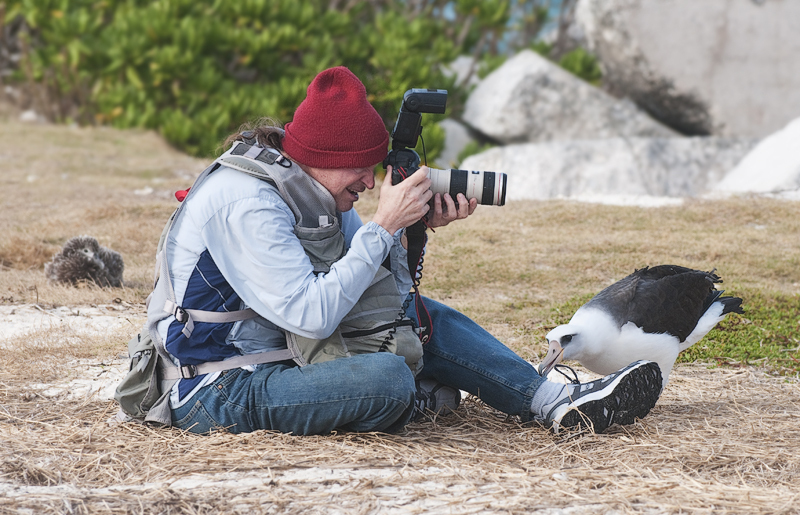 Working in conjunction with Joseph Van Os Photo Safaris I co-led two week long sessions on Midway Atoll, the first with Joe co-leading, the second with sidekick Robert O'Toole co-leading. Midway is located 1142 miles west northwest of Honolulu, Hawaii, some three to five hours by prop plane. It was the site of the pivotal naval battle that changed the course of WWII. After screwing up for most of the first day, days we sank three large Japanese carriers, Akagi, Koryu, and Kaga in the space of five minutes. Sometime later we sank Hiryu, another of their large carriers. Our large carrier Yorktown was severely damaged but stayed afloat only to be sunk by a torpedo attack the following day. Japan suffered huge losses of both experienced pilots, sailors, leaders, and ships. I intend to re-read "Incredible Victory" by Walter Lord and several other books on the subject. The thirteen folks in the first group and twelve in the second experienced some of the best bird photography imaginable. 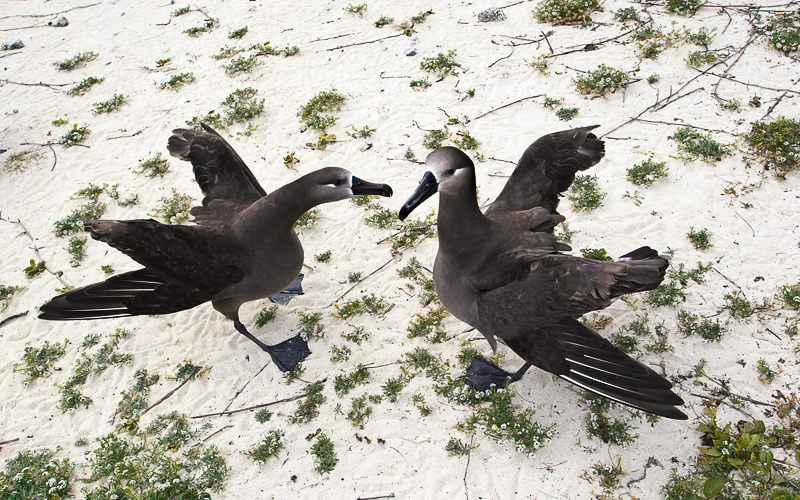 There are roughly a million seabirds per square mile on Midway, many of them ridiculously tame. 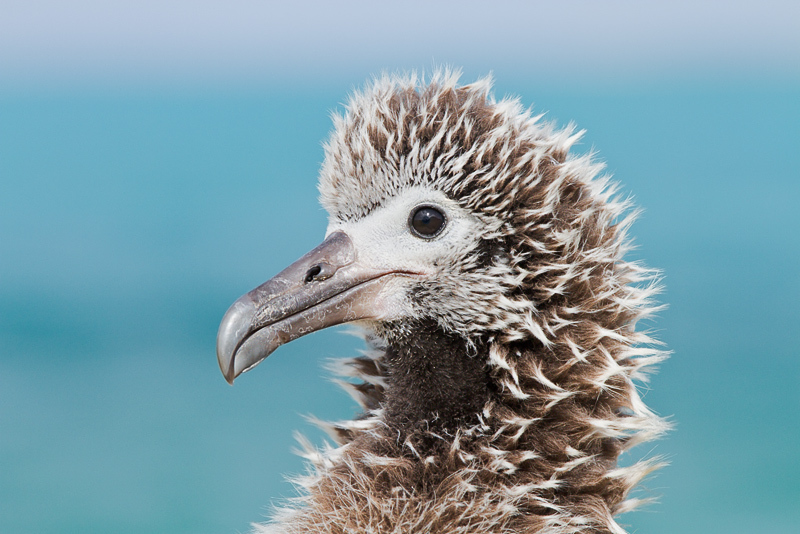 Nearly half a million pairs of Laysan Albatross nests occupy virtually all habitats on both Sand and Eastern islands and there are about 200,000 pairs of endangered Black-footed Albatross as well, the latter species almost always nesting close to the ocean. Throw in a million nesting Bonin's Petrels and you start to get and idea of the scope of the density of Midway's bird life; at times, things can seem surreal. The trip list was not a very long one: Aside from two numerous albatrosses we did get to briefly photograph Short-tailed Albatross, a mega-rarity. 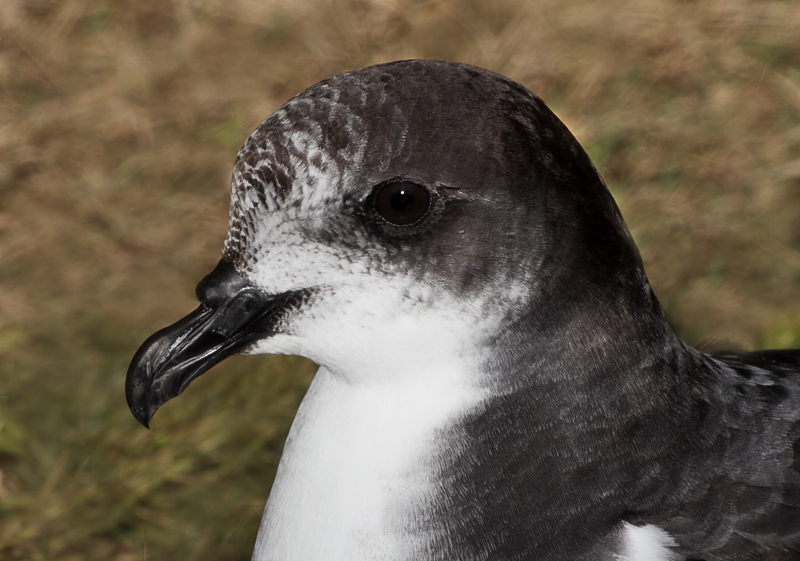 The aforementioned Bonin's Petrel. Red-tailed Tropicbird was easy as a look at the Blog shows; White-tailed Tropicbird was seen (8 pairs) but not photographed. 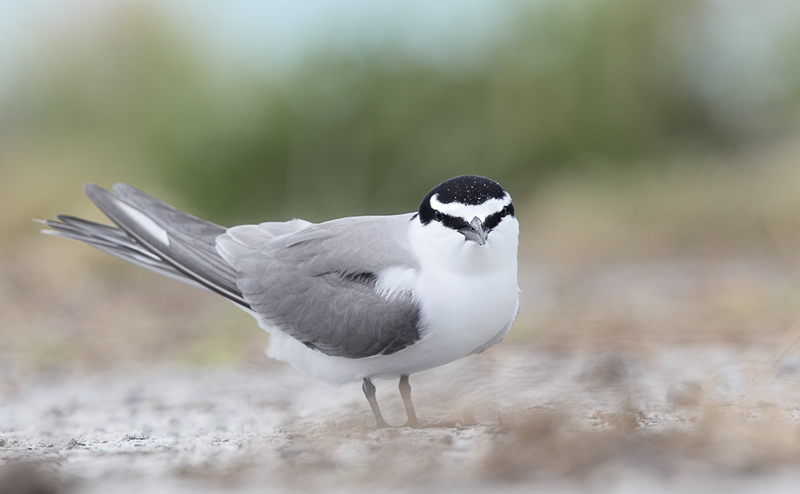 White Tern is numerous and tame and there are some photographable Black Noddies as well. Some folks photographed Brown Booby in flight at Bulky Dump. 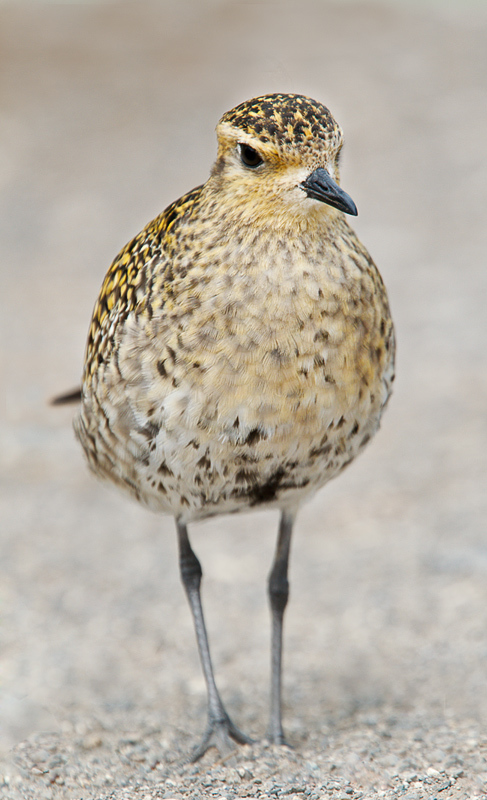 Shorebirds included the rarity, Bristle-thighed Curlew and lots of Pacific Golden-Plover and Ruddy Turnstone. Common Mynah (or Myna) and Canary are the two introduced songbirds. On Eastern Island we saw and photographed Great Frigatebird, white morph Red-footed Booby, Brown Noddy, early-arriving Sooty Terns, Gray-backed Tern, and the extremely rare (and introduced) Laysan Duck. 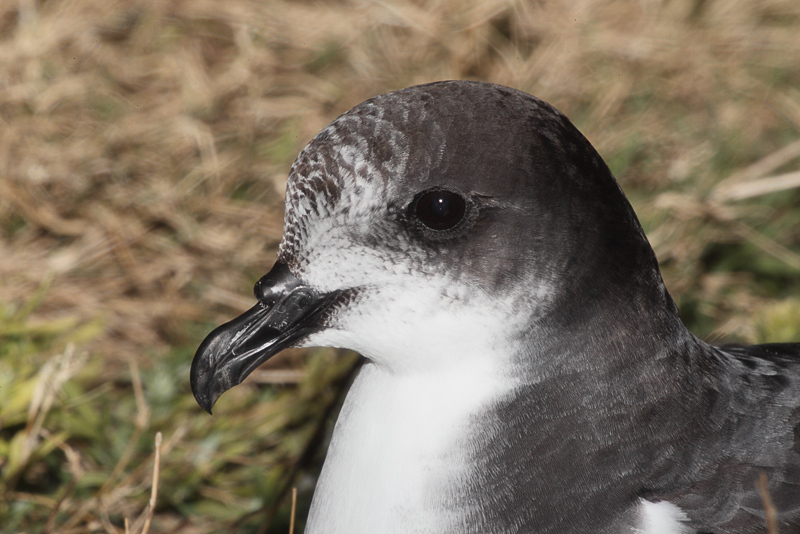 (Some of the 2nd group saw and photographed Christmas Shearwater on Eastern and a Masked Booby was seen briefly.) 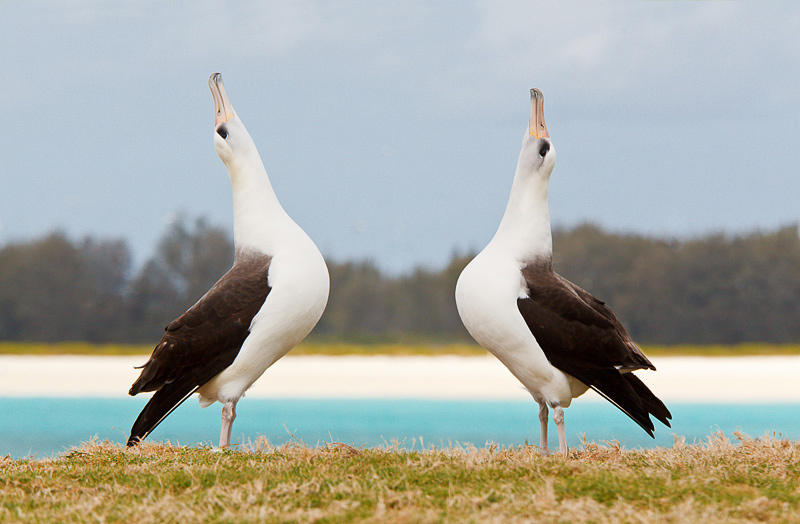 What the birds of Midway lack in diversity they make up in both numbers and tameness. And each day I learned a bit more about the photographic opportunities and was better able to put the group in the best position in a variety of weather conditions. The first group included IPT veterans Doug Canham, Ardith Bondi, Steve Bein, and Lillian Roberts. Noted bird photographer Brian Small's 1st cousin Joe Fuhrman was along as was the very brilliant retired hand surgeon Steve Garren joined by his life partner Kathy Sturges. Steve treated my trigger finger (and that of one of the refuge folks) with an injection of kenalog in the lobby of Charley Barracks; I am happy to report that mine has improved about 90% (as did John Hanna's; John is Project Manager for Chugach Industries Incorporated the Alaskan native group that runs the business side of Midway). If I ever need the surgery, Steve Garren will be the one who does it. After Midway he returned to Haiti to continue virtually around the clock volunteer surgeries on earthquake victims. It was great seeing Ron and Jacque Horn again: I had met them when I spoke at the eagle festival in Haines, Alaska two year back. Mary Ann Longshore stayed off by herself most of the time as a self-proclaimed "beginner." When the first group shared some images while waiting for the plane back to Honolulu she blew everyone away with her images; her compositions were so stunningly beautiful that most of the folks in the group accused her of being a professional photographer. <smile> It was a pleasure to meet talented young photographer Paul Mckenzie. You can view a selection of his best images by visiting www.wildencounters.net, clicking on 'Favourites,' and activating the slide show function. The second group consisted of almost all repeat offenders <smile> With Isobel Wayrick, Malcolm MacKenzie, Lou Newman, Ron Mayberry, Mikie Goldhamer, Bob Zarnke and Gill Arden from Canada, and Duncan and (non-photographer) Judy Douglas week two was like old-home week. Brit Tony Temple who brought and handheld the Canon 800mm f/4 L IS lens was as fine a fellow as you would ever care to meet and the other new-comer Tom Blackman of San Diego added a lot to the trip with his vast knowledge of seabird identification and biology. I will be working on a plan to return to Midway next April on either two one-week trips or a single two-week trip. 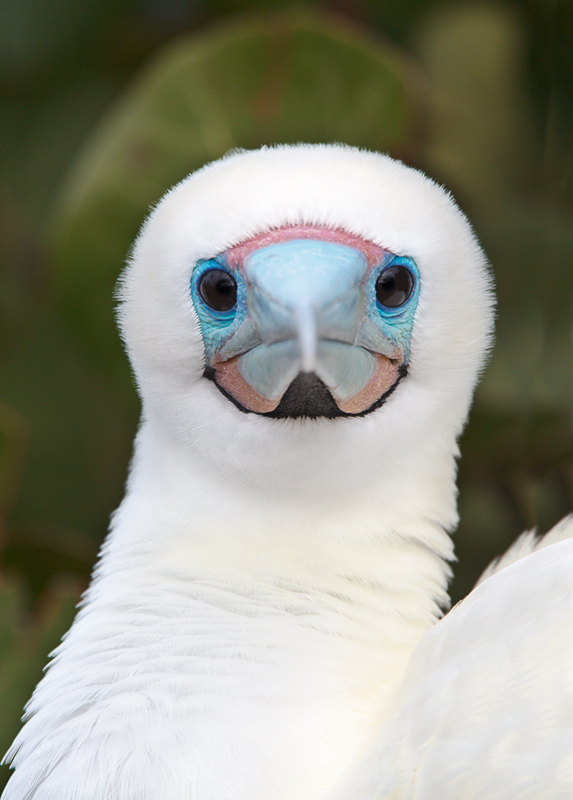 These would feature tropicbird and White Terns chicks in addition to the albatrosses. If you would like your name placed on the interested/waiting list, please send me an e-mail at birdsasart@att.net. Several of those attending this years trip have already stated that they will be returning with me next year. For more on my Midway visit check out the recent blog posts at www.BIRDSASART-Blog.com. These include "Midair Collision Over Midway," "Midway Continued: Creative Vision/Red-tailed Tropicbird Style, "More Midway," and "Midway with Joe Van Os." In addition you will find many more of my Midway images in these two BPN galleries: Avian: http://www.birdphotographers.net/forums/forumdisplay.php?f=2 and Out of the Box: http://www.birdphotographers.net/forums/forumdisplay.php?f=51. The 70-200 was my most used lens on Midway. 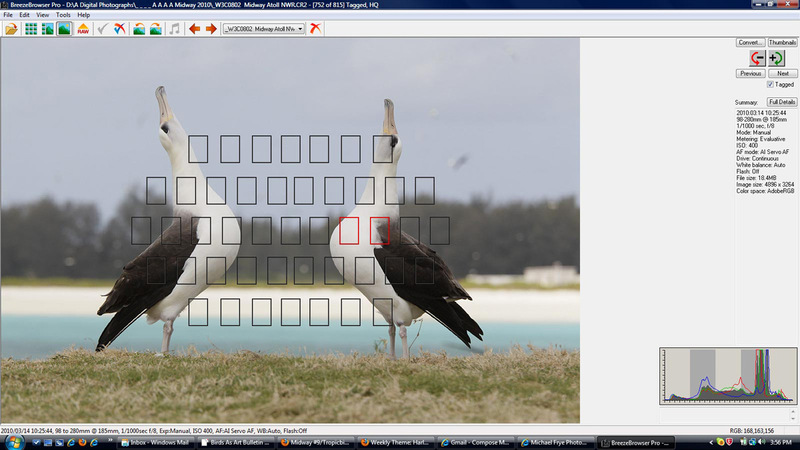 As noted, the Albatrosses could be very curious at times. 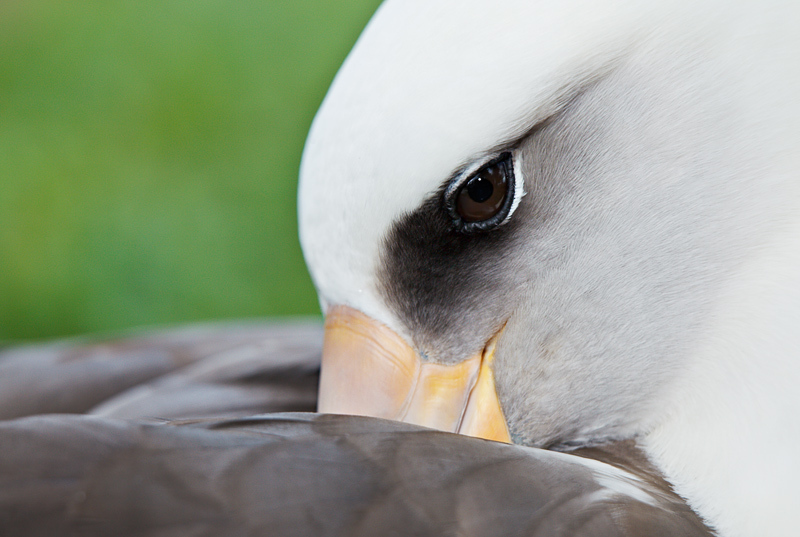 An inquisitive Laysan Albatross came up to me and began nibbling gently on my hand. 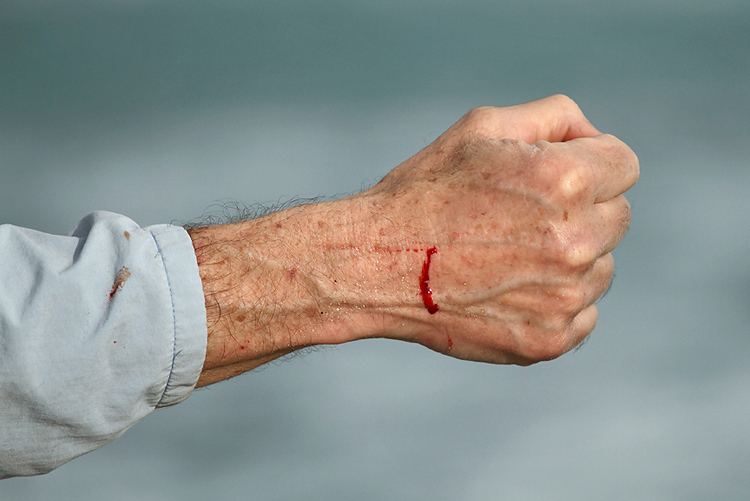 When I attempted to move him away the bird took a whack at my hand. If it happens again, I will simply move away <smile> My fault. Live and learn. Hi Kiang, Thanks for writing and for your kind words. First I need to comment on a few things before getting to your question. #1: If you focus on one bird in an image and the other is out of focus it is always because the birds are on different planes and you do not have enough depth-of-field to cover the second bird. Choosing and using One Shot AF would not make the second bird any sharper than if you had used AI Servo AF. #2: I am with you on not using rear focus for action (or for flight). My thumb gets tired quickly and it makes no sense to me to have to do two things (press the shutter button and press the back button) when you could get the same result by doing just one thing (press the shutter button). That said do note that some superb photographers like Robert O'Toole use back button focus 100% of the time. Now on to your question: You can try using AI Servo AF with all the points activated on the Canon bodies (45-point in the pro bodies or the full array with the pro-sumer bodies) or dynamic with the Nikon bodies but this choice often results in your losing focus at times, sometimes most frustratingly at the peak of the action. The other perhaps more attractive option is to select a sensor on one side or the other. It is best of course to choose a sensor that would fall on the body of the bird that seems most to be staying in one position <smile> This solution too will usually work but may fail at just the wrong time.... While neither of these is perfect each can get the job done most of the time. My first choice would depend on the details of a given situation. Later and love, artie. ps: please see the image below! Canon 70-200mm f/4L IS lens (handheld at 185mm) with the EOS-1D MIV. ISO 400: 1/1000 sec. at f/8. Exposure confirmed via histogram check. Note via the BreezeBrowser screen capture below note that I chose two off center AF sensors that fell on the right hand bird at a spot with lots of contrast. I love having all 45 AF points on the MIV manually selectable. Now, here is a bonus for the careful folks who have read this far: in the next Bulletin, I will be announcing two Homer Bald Eagle IPTs for late-March 2011 that Robert O'Toole has put together; we will both be leading. Homer better than it was in the good old days. Legal eagle feeding. If you would like advanced info including dates, price, and registration details please e-mail me at birdsasart@att.net with "Bald Eagle IPT" in the subject line. This one will sell out within hours. It will be announced to our Friend's List before being announced publicly. Canon 17-40 mm f/4 zoom lens (handheld at 22mm) with the EOS-1D MIV. ISO 400. Evaluative metering +2/3 stop: 1/1000 sec. at f/8. Canon 70-200mm f/4L IS lens (handheld at 173mm) with the EOS-7D. ISO 400. Evaluative metering at zero: 1/250 sec. at f/8. How does the image above look to you? It looks great to me as does the image quality of the master TIFF file. As I have been saying for years, good photographers make good images with whatever equipment they have in their hands. The current issue (Spring 2010) features my article, "Small But Deadly--The 70-200mm Lens" on pages 50-57. (For more great 70-200 images, check out this Bulletin!) This article is the second in what will be a long series featuring a variety of great Canon lenses. The first in the series detailed my love of the relatively new Canon 800mm f/5.6L IS lens that appeared in the Fall/Winter 2009/10 issue. There are too many great images and articles in the current to list but I would be remiss in not mentioning Kim L. Graham's opening Great Horned Owlets image (page 3) or John Gerlach's eagle silhouette (page 95). The newsstand price is $8.62 if you are lucky enough to find one but it would be much better to subscribe to Nature Photographer either on line at www.naturephotographermag.com or by calling 207-733-4201. Doing so will ensure that you do not miss a single issue. Helen's accomplishments over the years in growing the magazine into the respected publication that it is today have been monumental. Canon 70-200mm f/4L IS lens with the 1.4X II TC (handheld at 280mm) and the EOS-1D Mark IV. ISO 400. Evaluative metering +2/3 stop: 1/500 sec. at f/9. I arrived at Orlando Airport on Wednesday, March 17th. I had the Laredo Birding Festival on my calendar for May 24 (though I wondered why they chose such a hot time for a festival...) I was making plans with a friend for some late May travel and decided to check the exact dates and was shocked to see March (not May) 24 in the document. I called the folks in Laredo to tell them that there was an error in their literature only to learn that it was I who was mistaken. As I said, "Yikes!" By luck, my schedule for next week was clean and I was able to get a plane ticket to Laredo for Tuesday evening. If anyone would like to join me for a morning of private instruction on either Wednesday, March 24th or Sunday, March 28th ($500 per person), please e-mail me immediately at samandmayasgrandpa@att.net. I have room for two folks each day. Canon 400mm f/4 IS DO lens with the 1.4X II TC (handheld) with the EOS-1D Mark IV. ISO 800. Evaluative metering +1 2/3 stops: 1/320 sec. at f/8. Fill flash at -1 2/3 stops with Better Beamer. I inadvertently added 1 2/3 stops of light here; the image looked totally washed out on the back of the camera but there were no flashing highlights so I knew that it would look great after being processed. In reality, I had created an image with an excellent exposure. There were lots of Pacific goldens around but finding a tame one in an attractive setting was a challenge. This one was on a gravel road right next to our golf cart limo. I added canvas at the bottom and borrowed some gravel and a bit of a toe from another frame in the series (via an APTATS I Quick Mask). Canon 400mm f/4 IS DO lens (handheld) with the 1.4X II TC and the EOS-1D MIV. ISO 400. Evaluative metering +1/3 stop: 1/2000 sec. at f/5.6. This is one of the world's rarest birds. For the past few years, two adults and two young birds have been visiting Midway where they are highly protected; we were restricted to the golf carts for a single short photography session. I had my "big gun" ready with the teleconverter mounted. 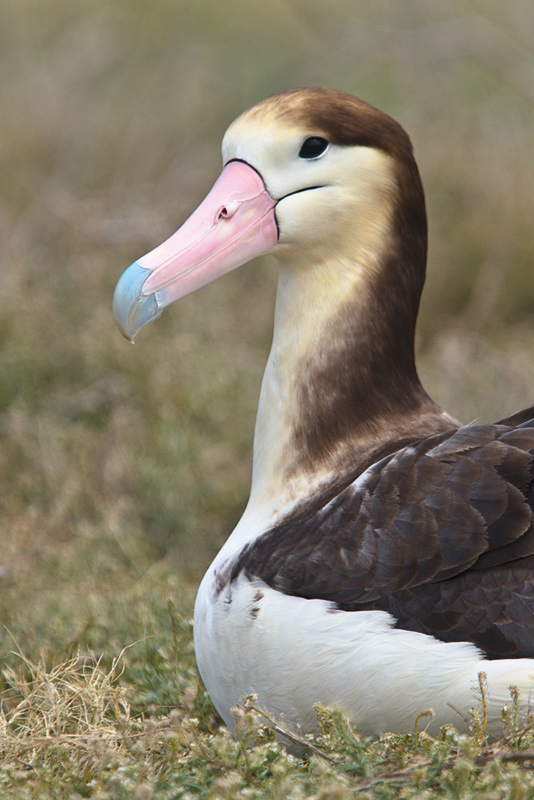 You can learn more about this species here: http://www.wfu.edu/biology/albatross/shorttail/shorttail.htm and here: http://www.birdlife.org/news/news/2008/03/start_translocation.html. St. Augustine Alligator Farm Workshop, May 14 to 16, 2010. Limit: 6. 3-DAYS: $850. (does not include lodging, meals, or ground transportation). 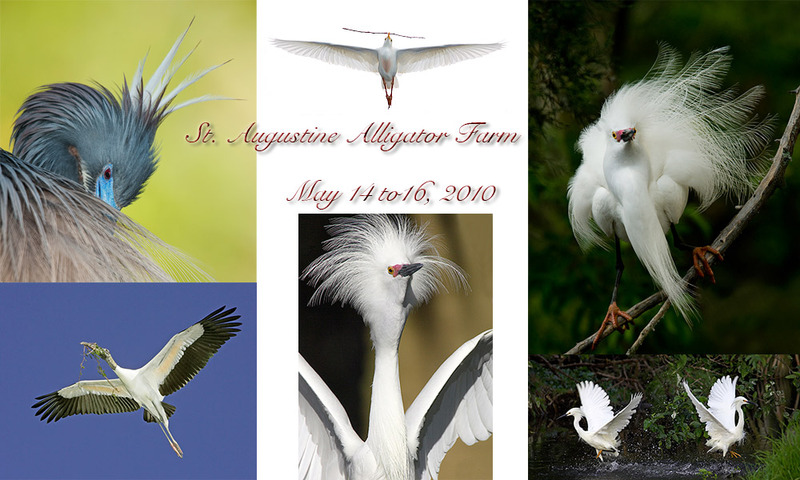 Join creative photographers Al and Fabs Forns at the Alligator Farm for a week-end of fun while you learn and practice. We will cover flight photography techniques, subject isolation, how to make good use of habitat, portraits and a creative approach. In the classroom, we'll cover Photoshop and Lightroom workflows and tips, and the use of artistic filters to enhance your images. There will also be critiques of your work. Six in-the-field and three classroom sessions. Maximum of 6 participants. Take advantage of a very small group and personal attention. Price is $850 per person that includes only instruction. Lodging, meals transportation and entry fee are your responsibility. Canon 400mm f/4 IS DO lens (tripod-mounted) with a 25mm Extension tube and EOS-1D MIV. ISO 200. Manual Flash as main light at 1:1 with Better Beamer: 1/60 sec. at f/22. There are many, many lessons here. This image was created in total darkness. We teamed up and took turns. One person would hold a flashlight s pointed at the bird so that the others could focus accurately. I carefully instructed both groups as to the proper technique for night photography and though I emphasized that using a tripod would produce the best results very few listened to me. Nearly all of the folks who handheld complained that there images were not sharp. Duh! The same went for using Manual flash as main light. I explained it and nobody did what I said. I was loving it <smile> What I did was to focus manually and listen for the focus confirmation beep. Being on a tripod, all of my images were sharp as long as there was enough light from the flashlight for me to focus accurately. By the 2nd night, we had that part down pat. Please continue with the next image. BOSQUE del APACHE 2010 IPT: �The Complete Bosque Experience.� NOV 20-26, 2010. Slide program on the evening of Friday, NOV 19. 7-FULL DAYS: $3199. (Non-refundable deposit: $500; see details below.) Limit: 10/Openings: 6. Co-leaders: Robert O�Toole, Jim Heupel, and multiple BBC Wildlife Photographer of the Year honoree Chris Van Rooyen of South Africa (http://www.wildlifephotography.co.za/). Live, eat, and breathe photography with one of (if not the) world's premier photographic educators at one of his very favorite locations on the planet. Plus great co-leaders and top-notch Photoshop instruction. Canon 400mm f/4 IS DO lens (handheld while lying on the ground) with the EOS-1D MIV. ISO 400. Evaluative metering +1 stop: 1/640 sec. at f/8. Fill flash at -1 stop with the flash mounted in the hot shoe. Thanks a ton to Doug Canham for the loan of his flash after mine died during the second week. I had never seen or even heard of this species when I photographed on our day trip to the fabulous Eastern Island.